Comm Eye Health Vol. 31 No. 104 2019 pp 80-81. Published online 10 February 2019. Professor of Clinical Ophthalmology: Queen’s University Belfast, Institute of Clinical Sciences Building A, Belfast, Ireland, UK. Ophthalmologist and Clinical Instructor: The University of Dodoma, College of Health Sciences, Tanzania, Kenya. Consultant Ophthalmologist and vitreoretinal surgeon: Wirral University Teaching Hospital NHS trust, Wirral, UK. Cataract surgery can influence the progression of diabetic eye disease, but may be necessary for treatment and to help the person function effectively. Here is how to make the most of it. Diabetes mellitus is a disease of elevated blood sugar due to the insufficient production (type 1) or action (type 2) of insulin. Type 1 diabetes requires insulin injections, whereas type 2 is managed with diet, exercise, tablets or insulin injections, if needed. Poor view of the retina means that laser and intravitreal injections to treat the visual complications of diabetes, such as diabetic retinopathy or maculopathy, might become impossible. 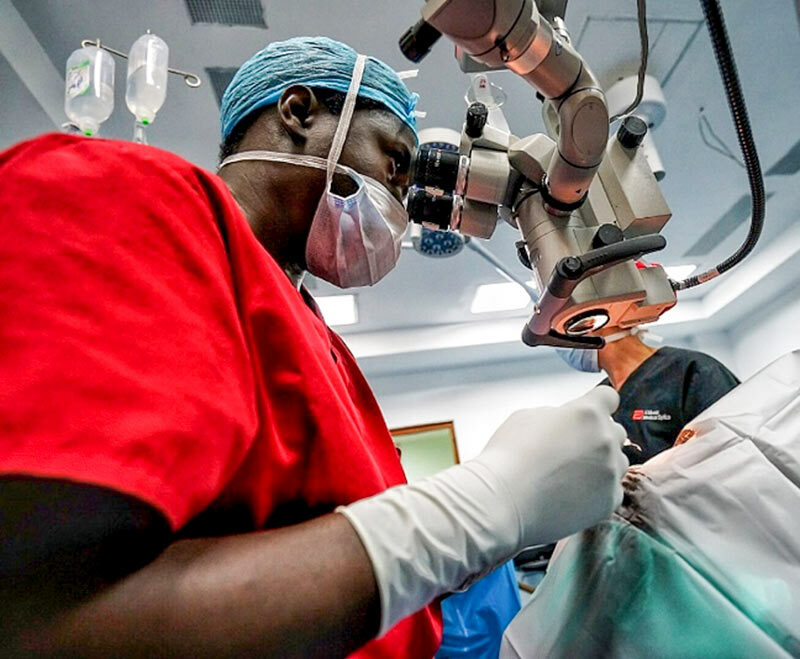 Without treatment, these can progress to the point where potential vision is so poor that cataract removal will not lead to visual improvement. Failing sight, due to cataract, cause practical difficulties with the timely administration of medication to control blood glucose (blood sugar). This is especially true for those who have to inject insulin. Unfortunately, cataract tends to have an early onset in those with diabetes and progresses rapidly if blood sugar control is suboptimal. This is most likely due to the osmotic changes taking place within the lens, usually resulting in cortical or posterior subcapsular lens opacities. In low- and middle-income countries, the first time many people are recognised as having diabetes is when they come to an eye clinic for cataract surgery. It is therefore vital to take a careful history, conduct a thorough eye examination and measure blood glucose before surgery to identify those who may have diabetes. People who are young and have both diabetes and cataract may have neglected their blood sugar control over the years or may not have had access to facilities to enable them to achieve good control. If blood sugar is not controlled, it will be very difficult to prevent vision loss to diabetic retinopathy. Cataract patients with diabetes must be referred to an endocrinologist or suitably qualified physician so their diabetes can be managed. Ensure that the endocrinologist or physician knows where to refer people with diabetes for regular retinal examinations, during which an eye care professional will check for signs of diabetic eye disease (diabetic retinopathy and diabetic maculopathy). All these factors have an impact on the progression of retinopathy. Squirrel et al1 noted that much of the progression of retinopathy in their cohort was due to natural history and that uncomplicated cataract surgery using phacoemulsification is not an independent factor for accelerated progression of retinopathy after surgery. (Editor’s note: the study did not compare phacoemulsification with small-incision cataract surgery). Zaczek et al2 and the UK EMR observational study3 found that eyes with pre-existing macular oedema had the worst prognosis for visual rehabilitation. If the fundus is visible prior to surgery and there is diabetic retinopathy and/or maculopathy, it is worth treating that as per the treatment guidelines in Table 1 prior to cataract surgery in order to prevent worsening of diabetic retinopathy. If the fundus is visible prior to surgery and there is diabetic retinopathy and/or maculopathy, it is worth following the treatment guidelines in Table 1, prior to cataract surgery in order to prevent worsening of the diabetic retinopathy. Table 1 Treatment of cataract surgery patients who have diabetes. It is important to manage the expectations of cataract patients who also have diabetes, as potential visual loss due to diabetic eye disease may affect the amount of visual improvement possible after surgery. Talking with patients about all the risks and benefits of treatment is an important part of the process, both preoperatively and postoperatively, as it helps both parties to clearly understand the potential visual outcomes of the operation. Discuss the potential need for postoperative interventions such as laser treatment and/or anti-VEGF injections, before taking consent. It is important to ensure that the patient is willing, and able, to come back to the clinic for these treatments. In patients with more advanced disease, ask what treatment they have undergone – e.g. laser treatment, anti-VEGF injections, or intravitreal steroids; this can also affect outcomes. From a medico-legal perspective, it is important to document all of the above information carefully. You can improve patients’ experience by giving clear instructions about how to care for their eye after surgery and when to come back. Put in place specific, identifiable personnel as a point of contact for patients. This will minimise the loss of patients at postoperative and subsequent follow-up visits. There have always been questions about optimum blood sugar control for patients with diabetes prior to cataract surgery. However, there is no published evidence to suggest that elevated blood glucose level at the time of surgery has a negative effect on outcome,4 and the risk of cancelling a patient (who may not return) may outweigh the benefits – if any exist – of deferring surgery until they control their blood sugar better. Cataract surgery in patients with diabetes can be complicated as a direct result of the diabetes. There may be poor pupil dilation due to lack of tone in the iris muscles, secondary to autonomic neuropathy; this is often seen in patients with chronic diabetes. If there is poor dilation, or in patients with intraoperative miosis, it is necessary to manually dilate the pupil, whether by using pupil hooks/dilators or by performing an iridectomy (see pp. 88-90). In younger people with diabetes and cataract, extra care must be taken as their capsule tends to be elastic, leading to complications such as capsular tears. Use trypan blue ophthalmic solution to stain the anterior lens capsule. Postoperative inflammation is expected to be worse in patients with diabetes. This can lead to contraction of the anterior capsule and phimosis, which in turn limits the view of the peripheral retina after surgery. Capsulorrhexis should therefore be large, which means the optic should be at least 6 mm in size. Ideally, patients with diabetes who have recently undergone cataract surgery should undergo a careful eye examination, including a detailed fundus examination, to check for excessive inflammation and signs of diabetic eye disease. Offer treatment as shown in Table 1. Cataract surgery in patients with diabetes is a complex subject. The level of retinopathy at the time of surgery, complicated or uncomplicated surgery and diabetic control all have a potential impact on the progression of diabetic eye disease. Despite these risks, cataract surgery may be necessary to allow the person to function effectively and improve their adherence to their prescribed diabetic medication regimen. Surgery may also be necessary in order to make it possible to treat diabetic eye disease using pan-retinal photocoagulation laser or other treatment options. 3 Denniston AK et al. The UK Diabetic Retinopathy Electronic Medical Record (UK DR EMR) Users Group, Report 2: real world data for the impact of cataract surgery on diabetic macular oedema. Br J Ophthalmol 2017; 101:1673–1678. doi:10.1136/bjophthalmol-2016-309838. 4 Keay L, Lindsley K, Tielsch J, Katz J, Schein O. Routine preoperative medical testing for cataract surgery. Cochrane Database Syst Rev. 2012 Mar 14;(3):CD007293. doi: 10.1002/14651858. CD007293.pub3. 5 Kumar et al, Glycaemic control during cataract surgery under locoregional anesthesia: a growing problem and we are none the wiser. British Journal of Anaesthesia, Volume 117, Issue 6, 1 December 2016, Pages 687–691.